My dad started working in the coal mines in 1931. He was working in the coal industry until 1977 when he retired, age 65. His first job was hauling coal with horse and wagon,and hand shoveling it into a Box Car at the siding, in Roche Percee. He started at the Eastern Collieries later in 1931. He supplied a horse, and hauled coal with a dump cart for .28 cents/hour. In 1933 he started working underground, driving and working on coal cutting and shearing machines. In April when the tipple burnt down, he was one of three men that filled the shaft with two wheelbarrows. Later he worked at the Wilson #2 Mine later he returned to the Eastern Mine to work on rebuilding the new Tipple. In 1958 he started to work at Utility Coals, until he retired in 1977. He was in charge of the horses underground that were used to haul the coal-cars from where the cutting machine was, to where the coal was hauled up to the tipple. He told many stories of these days, and it is too bad VCR's and Camcorders were not around in the 70's, to record these for future generations. Some of the stories I remember, are the fact that the horses were taken underground and never brought up until they died. It was said if they were to be brought to the surface they would go blind, from the sunlight. My Dad loved these horses as much as he loved us, of that I am sure. He used to tell us how the brakes would fail on the ore car and literally run down, and over the horse, and all the bosses would say is “get another horse and get working”. No down time for a crippled or dead horse! Same would happen when a man died underground, it was work as usual shortly afterwards. Dad used to tell us the dead or injured man would be brought to the surface on a grain door. No fancy stretchers or first-aid men here. My Dad told us he had many close calls, and danger lurked around every corner. The only difference between endangering oneself vs the horse was if the horse died, there was lots of explaining to do to the boss,as they cost money to buy, but there was 100 men around the corner to replace a dead man. Years later on hearing of an underground explosion, and men trapped, my Dad would get a tear in his eye, and I am sure a little prayer was said. Miners around the World, stick together even after mining! Stories have been told and songs have been sung about the Company Store, but looking at the pay stub below, you can see they were all true. A miner had to buy his own carbide to light his lamp underground. Tool rental was charged to dig the Coal for the company. Prices were outrageous and if you didn't buy at their store your job was in jeopardy, and also your company housing. He would tell us the story behind the miners strike that ended up with the RCMP killing 3 miners on Sept 29, 1931. These miners are buried in the Bienfait cemetery, and every so often a yellow stripe is painted on the tombstones to show the RCMP involvement. This same stripe gets scrubbed off every so often by police sympathizers. The Library in Bienfait has a very good video that all interested in this era should view. I believe it was produced by the CLC. It has both perspectives in it. Interviews with the Police Chief in Estevan at the time, and also interviews with miners from that era. It shows the living and working conditions of the miners, and the cheating on the pay. Most miners were paid by the hour, but some I guess were paid by the Coal-car load (they had to load the car by hand) and were paid by the weight of the Lignite coal they loaded. The person weighing the coal was management (or in bed with them) and would say the weight was less than it actually was. Another way for the company to shaft the men. A definite must see! Wonder why there is Unions today? Well investigate the history of workers of this era. Today you can see depressions in the ground between Estevan and Bienfait and most of these would be underground cave-ins from these old mines. Just before my Dad died, he was called upon to identify old mine locations to the authorities so these could be looked at. Cave-ins could be very dangerous, and over the years, people have climbed into old mines etc. and have been buried alive. Recently I believe some children were involved. Today there is not many alive who know where these mines were, so they can be checked and dismantled, to eliminate the danger. The mines took their toll on my Dad's life, and over the years he had an operation on his diaphragm as well as had other breathing difficulties. It definitely shortened his life. I feel sorry for all those that endured the same fate. 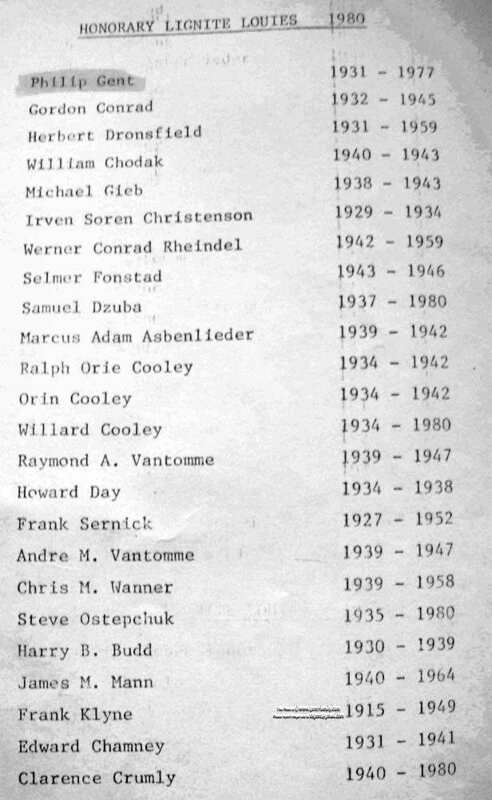 Years ago, in Estevan, they started to recognize the “old” miners of the area, and a “Lignite Louie” was chosen each year. I hope this has continued today. 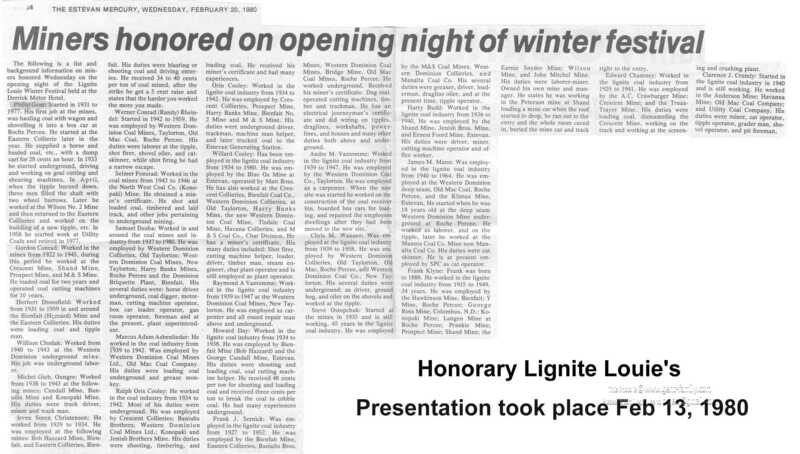 Above is the Feb 20th, 1980 article from the Estevan Mercury showing my dad and others being honoured, by naming them Honorary Lignite Louie's on Feb 13th, 1980. A Proud Moment for my Dad, no doubt. Oil became the resource in the 50's & 60's and Coal mining was their poor cousin. Thank God for people like Mr Leonard Gadd, Mr Souther, and the Walliser family, who worked at, and helped maintain the Little Museum in Bienfait, devoted almost totally to this way of life. I am sure lots of people who live in Estevan haven't been there. What a shame. Schools should be taking trips down there to see this display. Without the Coal the people might not have even settled there. The farmer those days barely made a living and without the coal mine would have barely existed. Would the train have come to this area without Coal? I doubt it. Would the Power Plant that feeds electricity to that area exist?, No. I could go on and on. We owe a huge debt to Coal and the Miners who worked with it. As an aside to the Power plant and acid rain issue, I remember as a kid seeing nothing but white alkali soil everywhere nothing would grow near any slough, but today all sloughs are green and lush and loaded with ducks. Some areas need a little acid to balance the PH and I think this is one. I am no Geologist etc. but it does not look like it is hurting this area too much anyway. There is so many environment issues today that emissions are much reduced from the past. Carbon Capturing is now being used at the Boundary Dam. I assume emissions are much lower now. The reclamation of the land is much improved also, so if it has to be mined, they seem to be doing it at least better than before. We need jobs, we need power, so not much you can do. A hell of a lot better than nuclear in my eyes! My dad saved some of his mining equipment, and today I have those in my possession, and these will be handed down to my son to be passed down to his offspring maybe some day. I love to show this material to people and am very proud of my dad and his involvement. I have his carbide lamps, plus Dad's first “ hard hat” that wouldn't save too much of anything, but keep coal dust off your hair! It is made out of a type of press wood that you see in cheap bowls today.